GABRIËL & NOAH: PRINCES DE NASSAU! Amazing news How her title will sound like? Princess Tessy of Luxembourg? Oh, wait; Princess Tessy. I guess I always thought she'd get her title, I just didn't realize it would be this soon. On occasion of the National Day HRH The Grand Duke Henri created Tessy de Nassau Her Royal Highness Princess of Luxembourg. 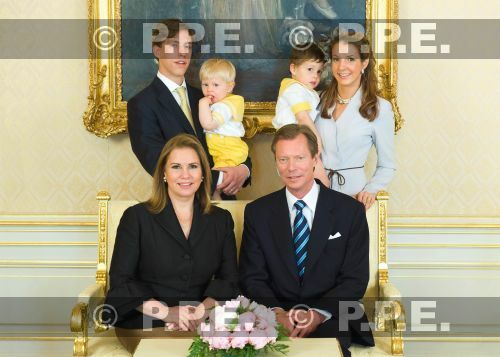 The sons of Tessy and Louis have been created TRH Princes Gabriel and Noah de Nassau. Wonderful news ! I am so glad ! It makes my day ! I love that family ! Oh Lucien! Thank you so much for that news! I'm happy for Tessy! I think it is wonderful that the boys have titles. It seems like Tessy and Louis are great together and I am happy for them. I'm so happy that GD Henri decided to grant appropriate titles to Tessy and her sons. I think that Tessy has acquitted herself quite well under very difficult circumstances --- not easy for anyone, especially someone in the royal circles, to have a child out of wedlock. Cheers! i do not know myck about Tessy, is there any bio on her? Maybe the official website will be updated now Tessy and her sons are Princess/Princes. That's such wonderful news, I'm very happy for Tessy, Gabriel and Noah! The Luxembourgian Royals showed once more what a closely-knitted family they are. The official picture of Their Royal Highnesses (I LOVE saying this) is nothing short of wonderful, thanks for it Lucien! Maria Teresa and Tessy look stunning, both Grand Duke Henri and Louis don't lack good looks and the children are adorable. Is she created a princess in her own right, or only as a result of her marriage? My Luxdembourgish is not fantstic, so I couldn't quite discern what was written entirely. HRH Princess Tessy,created in het own right as she was elevated to that rank by the Grand Duke,not as just the social custom has it that women take the curtesy title of their husband. This means the Grand Duke will bestow similar honours on all his future daughter-in-laws, doesn't it? Otherwise, it might be deemed unfair that one of his daughter-in-laws is a Princess in her own right, whereas others will become ones only by virtue of their marriages. It is in line with the policy of the Grand Duke creating all members,"morganatically" or not,to the title.It already happened with other members of the Family previously deemed originating of a morganatic marriage. I'm glad Grand Duke Henri decided to give them the titles. Congrats to Tessy and her sons on the new titles! This has been a wonderful National Day everyone looks great!!!!!!!! !